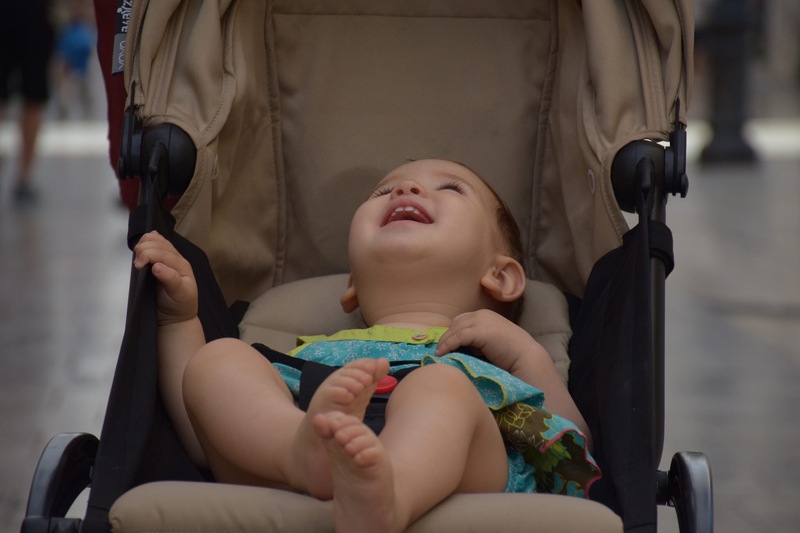 Some friends of ours in Corea had the same stroller, so Dani could see it and fall in love with it (I had already tried, seen and saved it in the small compartment of my brain in which I keep future purchases). Not many folding baby chairs in the market could suit us; if it didn’t leave at least one free hand, it wouldn’t do. On many occasions I have to travel by myself and I can’t easily manage. 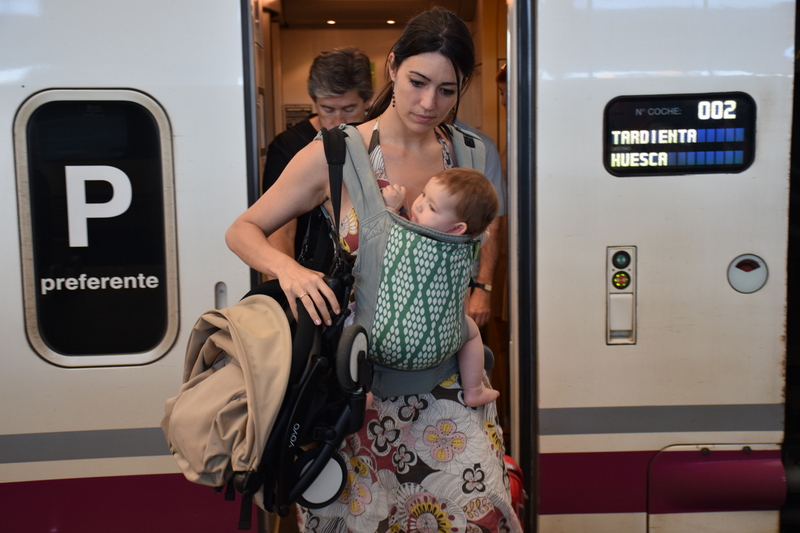 Getting out of the train with the folded stroller. It’s really light, only four-and-something kilos. It’s amazingly compact, in fact, it fits as hand luggage! There is one which is even a bit more compact: the GB Pockit, but it’s noticeably less confortable: more complicated to fold, less solid and harder to handle, the parasol is tiny… to sum up, it didn’t convince us as much as the Yoyo. It fits as hand luggage on aircraft. It spreads open with one hand in a second! 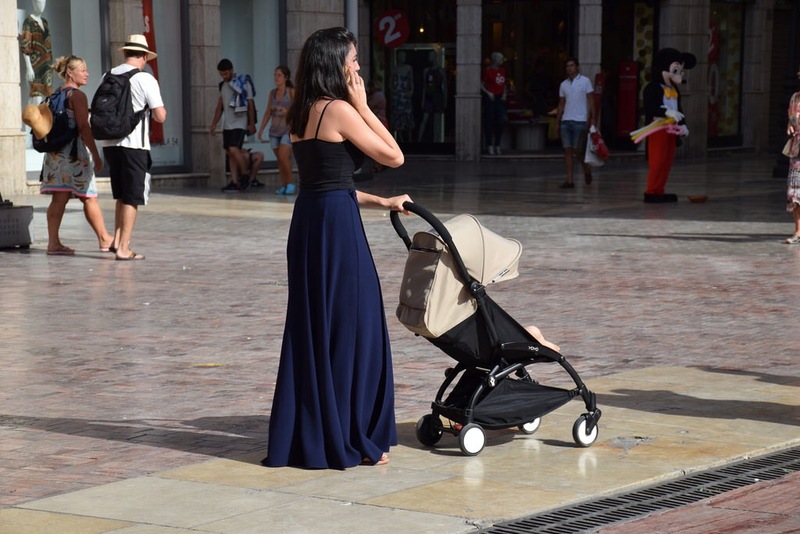 The canopy (which has a very good size in comparison with most pushchairs) has a small transparent part on the top through which you can see your little one. 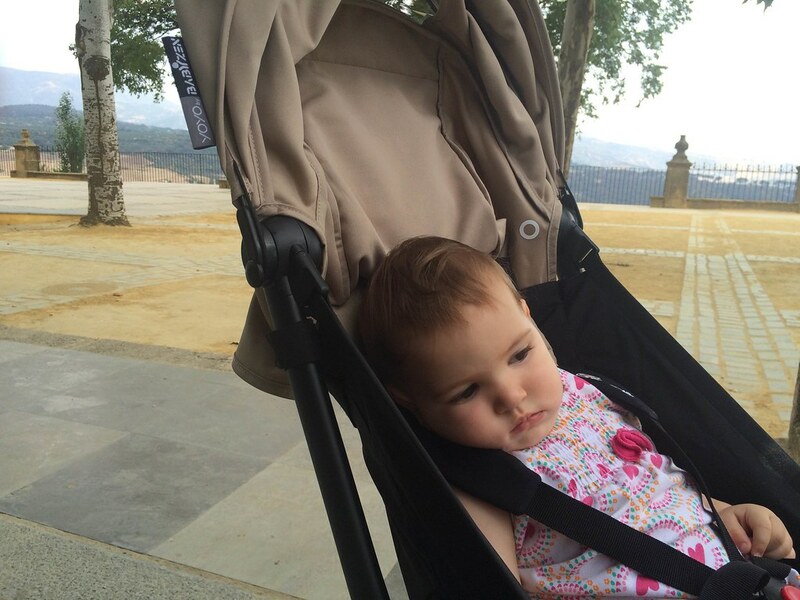 The large handle allows you to manoeuvre the stroller with one hand. Four-wheel-drive makes it so easy to move! Using the stroller with a single hand. It’s surprisingly robust. One would think that a foldable stroller (especially such a compact one) would be more unstable, but it’s not the case. It makes the most of its width; the chassis or the wheels barely stand out, so it fits almost anywhere and the child has a lot of space. Eva is so comfortable on it! It has a lot of storage space: a lower bag as well as two compartments in the rear (one of them with a zipper, comes in handy for your phone or wallet). The canopy is attached to the lower part with velcros that we can let loose for the air to come in even when the cover is on. The seat can be reclined. Eva has had wonderful naps in her buggy. You can hang it from your shoulder thanks to a padded belt. The safety belts for the child are also padded for their comfort. 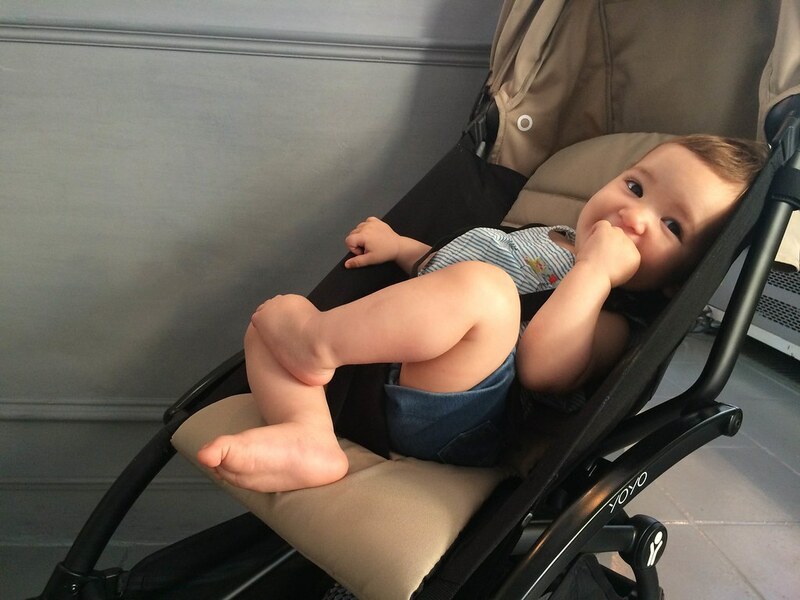 There’s the possibility of using it since the child’s birth by adapting the stroller with the newborn pack of covers. 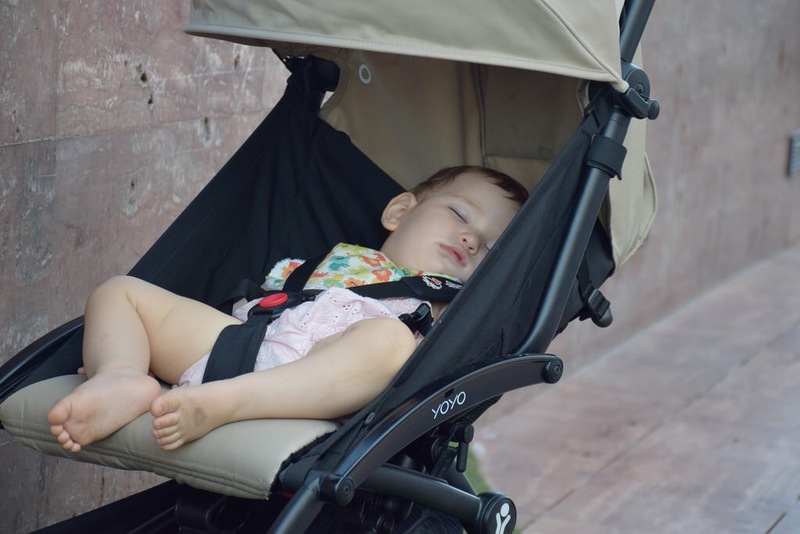 You can attach the child’s car seat, which is very unusual in foldable strollers. It comes stored in its own cloth bag. One of our summer trips. Watch out because the previous model is still being offered almost everywhere for the same price. It’s also very good but the 2016 model has been added some improvements such as a wider canopy or the storage space. You can choose the color of the chassis (black or white), of the canopy and the mat (taupe, pink, red, blue, grey or black). Some gadgets can be added, like hooks for the handle or bottle-holders. We haven’t added anything for the moment. At the beginning, our intention was to buy it in a big department store so we could take it for repairing or exchanging in any city, but besides being noticeably more expensive, they kept on delaying the date of delivery. I finally decided to make the purchase at Crioh, which turned out to be the best decision! They kindly assisted me over the telephone, I made the order on a Tuesday afternoon and got it right the next morning! 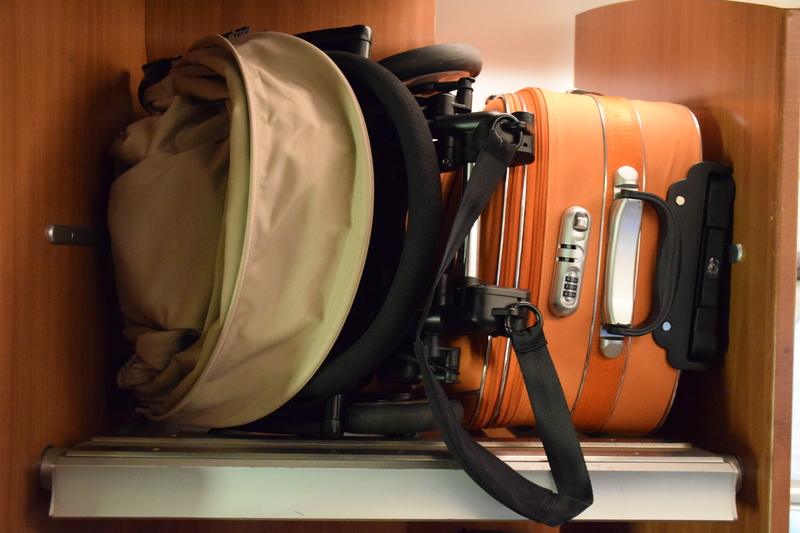 Besides, they included a mattress -that I haven’t used yet because I think it will be too hot for her- , a nice and big changing bag with many compartments, and the most compact plastic raincover in its own little bag (which matches the stroller, amazing!) It came out to us QUITE cheaper, and the guarantee included home pick-up in case of breakdown, so that fear was solved. 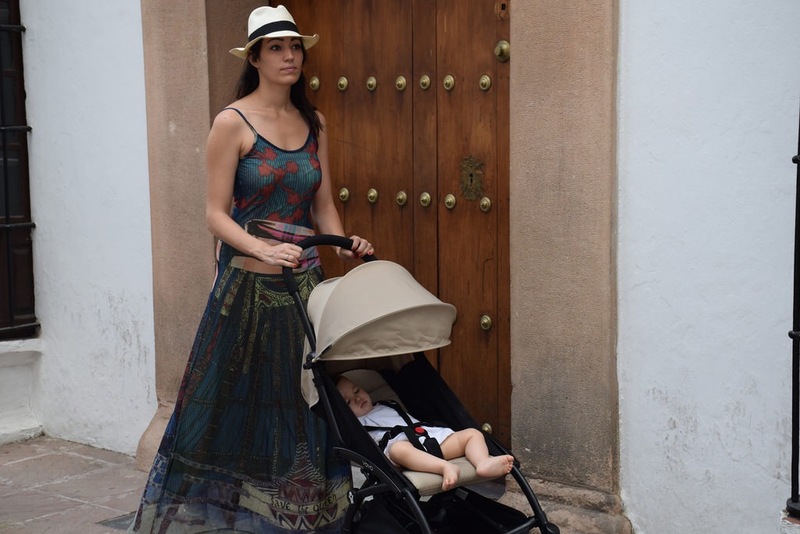 I could carry on explaning the tons of advantages of this pram that has stolen my heart, but I have this irresistible urge to keep using it and go for a stroll with my little beaver. Out and about with Eva. One last advice: I find it very practical to store the stuff I usually carry (blanket, wipers, baby food jars…) inside a cloth bag in the lower compartment instead of leaving everything scattered. That way, if we need to fold the stroller rapidly I don’t go crazy picking out every item one by one. Did you like it? Had you already heard about it? Has anybody used it?